The National Insulation Association (NIA) is pleased to announce the introduction of a new Code of Professional Practice (CoPP) specifically for installer members working in the New Build and Commercial sectors. The new CoPP has been designed to give additional reassurance and peace of mind to specifiers, developers, architects and builders and to highlight the quality, standards and professionalism they can expect from an NIA member. Therefore, NIA Members should be the preferred choice for their upcoming projects. 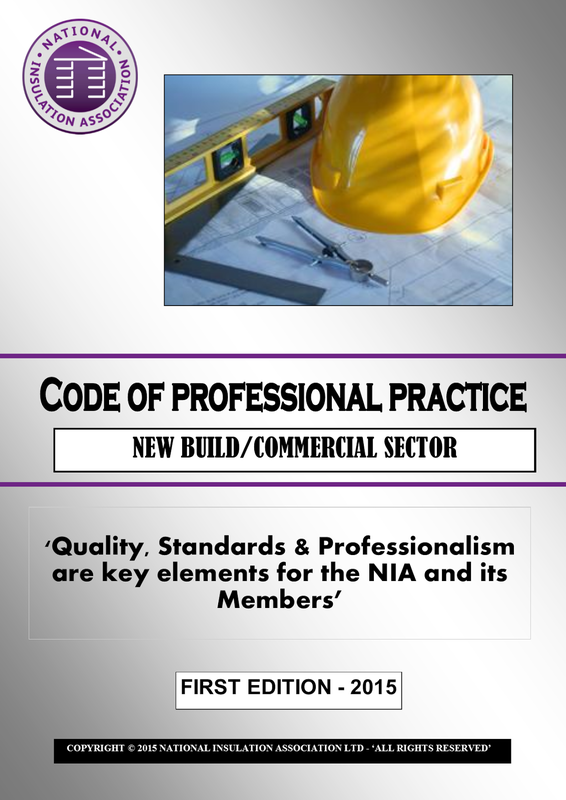 All NIA installer members working in the new build/commercial sectors will have to follow the new code which contains standards for; Training/Accreditation, Technical Competence, Health & Safety, Insurance, Complaint Handling, Service Levels, Quality Assurance, Technical Advice & Support, Client Care, Approved Products/Materials and Guarantees. Neil Marshall, Chief Executive of the NIA commented: “We advise specifiers, funders and project managers looking for insulation installers to work on New Build and Commercial projects to use our members who have signed up to this new code. It will ensure they get the highest possible standards from within the industry. The NIA is the lead trade body for insulation measures in the UK and our members can provide multi measure solutions. “Insulation companies involved in the New Build/Commercial sectors should join the NIA as our COPP will set them apart from others. Following today’s launch by the Scottish Government of its new HEEPS Cashback and Interest Free Loan schemes, the National Insulation Association (NIA) is urging Scottish householders to contact its members to take advantage of the schemes to upgrade their property’s energy efficiency. Up to £1200 for a range of other recommended energy efficiency measures, from within three categories including cavity wall insulation, loft insulation, draught proofing and boilers. Up to £100 refund for their Green Deal Advice Report if at least one recommended measure is installed. Households in Scotland can now also apply for an interest free loan of up to £10,000 for installing a variety of measures including solid wall, cavity wall, loft and roof insulation, draught proofing and boilers. The HEEPS Loan scheme is open to owner occupiers, private tenants and registered private sector landlords in Scotland. The repayment period varies based on the amount borrowed but those taking out higher value loans for solid wall insulation for example will be able to pay back over 10 years. Neil Marshall, Chief Executive of the NIA commented: “We welcome the new Cashback and Loan schemes which will make home insulation even more affordable and we are urging householders in Scotland to contact their local NIA member to find out if their home requires additional insulation and for details of these new schemes. website www.nia-uk.org or call 08451 636363.